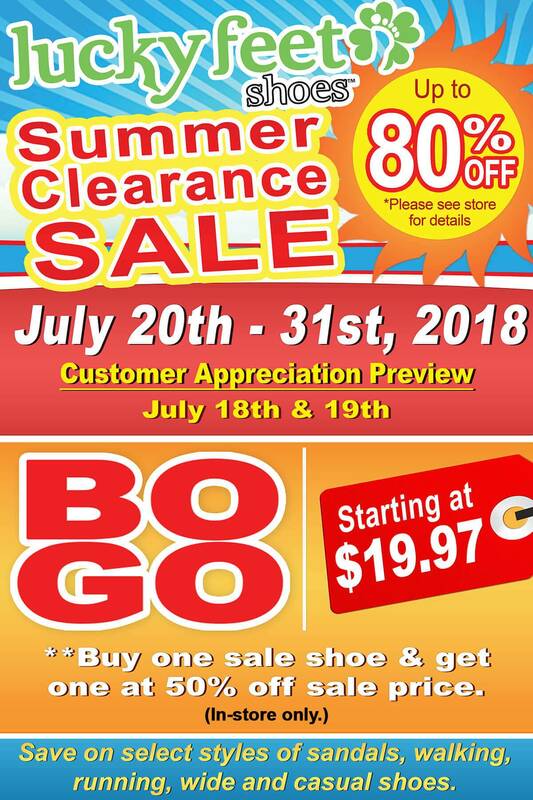 SUMMER CLEARANCE SALE! Markdowns from $19.97 | Up to 80% OFF + 50% OFF the Second Pair! Don’t miss out on our in-store SUMMER CLEARANCE SALE! Sale begins July 21st and runs through July 31st. Valued customers will have a chance to enjoy a special preview from July 20th to the 31st. Find select styles marked downs between 30% to 80%. Select shoes will be priced at $19.97 and up. Offer cannot be combined with other promotional or discount codes. CLEARANCE STYLES ARE FINAL SALE: no refunds, returns or exchanges. Offer applies to all in-stock merchandise only. Bogo promotion only applies to in-store purchases. 50% additional discount will be given on the second pair of shoes, which must be of equal or lesser value. Valid only on the purchase of select, in-stock merchandise; BOGO in-store only.